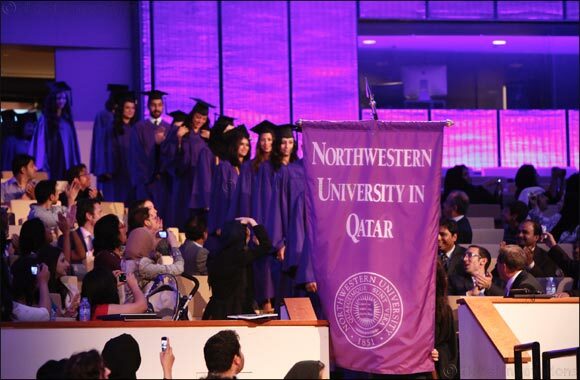 Doha, Qatar – March 31, 2019 – Sara Abdullah Al-Saadi will return to Northwestern University in Qatar (NU-Q) to deliver this year’s commencement speech. Al-Saadi, a graduate of NU-Q’s inaugural class in 2012, is the director of public diplomacy at the Qatari embassy in Washington D.C. and a student at Columbia University’s law school in New York. “As NU-Q marks its 10th anniversary in Qatar, it is fitting that we have one of our graduates serve as this year’s graduation speaker. Ms. Al-Saadi is an outstanding communications professional who is making her mark in public diplomacy,” said Everette E. Dennis, dean and CEO. Al-Saadi joined the Qatari embassy in 2014 and has been responsible for the development of the public diplomacy office, as well as overseeing the embassy’s strategic planning and communication. In her role, Al-Saadi manages engagement with non-governmental organizations, including think tanks and educational institutes and also oversees Qatar’s $20M aid fund which has been used to support victims of hurricane disasters in Haiti and Texas, U.S.
During her time at NU-Q, Al-Saadi served as president of the student government and was awarded the NU-Q Student Leadership Award by the University’s President Morton Schapiro. She also produced a documentary film, which won honors at the Doha Tribeca and Emirates film festivals and was featured in the Cannes Short Film Corner. Her study abroad included a stint at Harvard University where she served as assistant to the director of the Islamic Legal Studies Program. Al-Saadi had internships at ExxonMobil Qatar and Al-Jazeera English. After she graduated from NU-Q, she joined the Ministry of Foreign Affairs where she worked for two years as a communication officer before moving to the Qatari Embassy in Washington D.C.
NU-Q’s graduation will take place on May 6th and celebrations will include a suhoor following the ceremony for the graduates, their friends and family, along with the entire NU-Q community (faculty, staff, students, and alumni) to celebrate the University’s 10-year anniversary in Qatar. Graduation speakers at NU-Q are selected by the Graduation Speaker Committee, composed of faculty, students, and staff. Previous graduation speakers have included columnist and commentator Rami Khouri; author and filmmaker Sophia Al Maria; filmmaker and Oscar nominee Jehane Noujaim; social entrepreneur Shiza Shahid; award-winning BBC anchor and correspondent Lyse Ducet OBE; Northwestern alum and best-selling author and magazine journalist Derek Thompson; and Oscar-winning filmmaker and renowned journalist Sharmeen Obaid-Chinoy.